Opposition leader Kizza Besigye speaks during a news conference at his home at the outskirts of Kampala, Uganda, Feb. 21, 2016. Uganda’s main opposition party says it's working hard to gather evidence to legally challenge the outcome of the February 18 general election. Uganda’s electoral law says challenges can be filed up to 10 days after results are announced. Mugisha Muntu, chairman of the Forum for Democratic Change, said the party was doing everything possible to meet the deadline, despite what he said had been continuous harassment and intimidation by state security operatives. Muntu noted that the intimidation followed the frequent arrests and subsequent release of Kizza Besigye, the FDC presidential candidate. Muntu said security services had raided party offices and arrested data entry clerks, but "we are not deterred. We are continuing to gather evidence to be able to move in that direction [toward a challenge] once a decision is firmly made." Badru Kiggundu, the electoral commission chairman, declared incumbent Yoweri Museveni the winner of the presidential election with 60.07 percent of the votes cast, while Besigye was second with 35.37 percent. Kiggundu insisted the general election was credible, despite preliminary reports by local and international observers that the poll was neither free nor fair. 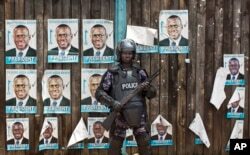 A Ugandan riot policeman blocks the gate of the party headquarters of opposition leader Kizza Besigye, shortly after raiding the premises for the second time in a week, in the capital Kampala, Uganda, Feb. 22, 2016. Muntu said initial evidence showed some of the poll results had been manipulated. He said results on the declaration forms signed by all party representatives, which show the results at the polling stations, were different from those the electoral commission announced. Opposition groups also accused the electoral commission of bias after voting in areas where they were strong — including the capital, Kampala — started about seven hours later than in areas where the ruling National Resistance Movement (NRM) had a strong following. The FDC said the delays were a deliberate attempt to suppress opposition votes. The electoral commission denied the accusation. It said the delays were regrettable but insisted that the results were credible, despite the logistical challenges. Some FDC supporters said they weren't confident that the party’s legal challenge would succeed, contending that the country’s judiciary is not independent. They also said the government could pressure judges to rule in its favor. “In our decision to eventually go to court, [judiciary independence] is also one of the factors that is being considered,” Muntu said. Supporters of the NRM said the opposition parties were sore losers. They said the opposition parties weren't complaining about parliamentary races in which they defeated government ministers but were challenging losses to Museveni in the same areas.